The concept of CLO has long roots in finance, with CLO standing for “collateralized loan obligation.” However, CLO standing for “chief learning officer” and as a member of the C-suite is a relatively new concept and role. GE was the first company that pioneered this role and created the title in 1994 when Steve Kerr stepped into that position. Wanting to know exactly how this role originated, I thought what better way to do that than to speak with Steve Kerr himself, who is now a frequent keynote speaker and an international management consultant. In 1989, GE had launched its famous “Work-Outs,” and that’s when Steve Kerr met Jack Welch, the legendary CEO of GE. At the time, Kerr was the dean of faculty at the University of Southern California business school. This partnership led to transformational initiatives whereby they ripped out the old-fashioned passive suggestion system at GE, replacing it with a call to ongoing improvements with a slogan of “Finding a Better Way Every Day.” This undertaking started as a drive to change the GE culture in 1989. It took five years before it led to the creation of the CLO role. Serving as a long-term consultant for GE, and to Jack Welch, Welch offered Kerr a full-time position running the leadership development function. Even before title discussions emerged, Kerr started exploring how to craft this role to maximize its relevance to the organization (note that while GE did have a leadership development function previously, it did not have a CLO role at the time). Kerr started asking himself and other leadership team members what he should start doing, stop doing and keep doing. As the discussions progressed, his colleagues suggested that Kerr should have a title that reflected the nature of what he was doing, so “chief education officer” made sense. In our acronym-heavy corporate world, this would make Steve Kerr the CEO. When Kerr shared the chief education officer title with Jack Welch, the latter promptly responded that “One is the right number for CEO at GE.” Furthermore, Welch observed that “education” was a noun, and by its nature it made it a passive statement. And Welch wanted to drive change. They discussed the position in the context of the CIO (chief information officer) and the relationship the two roles would have. 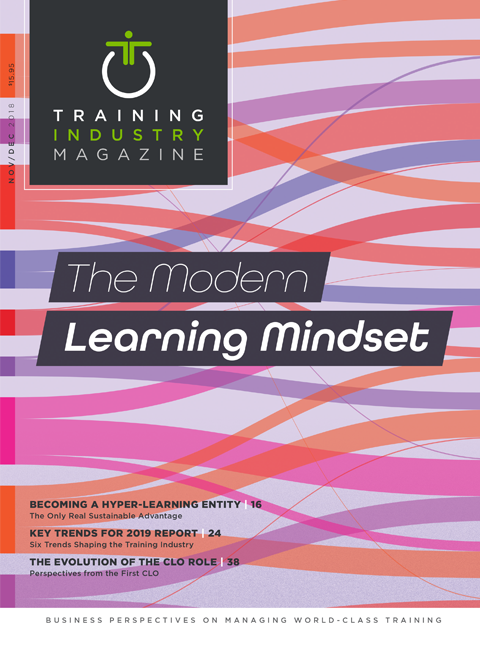 So, enticing action, driving change, and ensuring GE became an evolving and learning organization were key considerations in how the CLO title came to life, with emphasis on “learning” as an active undertaking. When Steve Kerr became the first CLO in the world, there was no proper job description, and no precedent. It was both exciting yet scary at the same time. It was also history-making. As Steve Kerr discussed the corporate landscape where this new role was created, it became obvious that this was not an accident, but rather the alignment of key business factors and leadership insights that led to the creation of the CLO role. Kerr said that Jack Welch emphasized the importance to GE of being known as an integrated company. Welch noted that the average conglomerate or holding company was typically valued at 15 to 19 times earnings, while GE was valued at 28 times earnings. Welch remarked that “nobody could believe you could be that big and be truly integrated.” Being that big and integrated translated into billions of dollars of additional market capitalization for GE. Steve Kerr is candid when he explains that at the outset he “did not have a particular plan, and took advantage of the tailwinds that were underway.” Kerr’s openness to evaluating the GE cultural landscape without a constricting plan may have facilitated his success. With his academic background, Steve Kerr knew the fundamental psychology principle that Ability x Motivation = Performance, and realized that he needed to enhance both ability and motivation for people to start moving information across GE. To motivate people, Kerr’s team identified some of the barriers to motivation. Key to this was how information was viewed. If you think of information as valuable currency, then how you deal with that currency presents an entirely new perspective. If hoarding currency by not sharing it with others is viewed as stealing from the organization, then it’s a game changer. This is precisely what Jack Welch engineered to remove the barriers to motivation. Jack Welch became an ardent advocate and supporter of information sharing across GE. On his visits to the far-flung divisions of GE, when a local GE business leader bragged to Welch about how they were particularly successful in using a certain approach, Welch would ask, “Who else is using this?” And if it turned out that a best practice had not been shared, people were at risk of being fired. This drove behavioral change and reinforced the importance of sharing information and best practices across GE boundaries. If you think of information as valuable currency, then how you deal with that currency presents an entirely new perspective. The new CLO’s office took a multi-pronged approach to driving organizational change at GE. Specifically, they enticed people to seek out the best information, and to facilitate finding it and efficiently sharing what they have. This 911 system enabled GE to match up the need with the opportunity. People started sharing that they had a new exciting management training program, or that they had an effective order remittance system, or that they had a new breakthrough while developing a new product and introduced a new process. It wasn’t just the 911 system that helped drive this cultural change. Kerr worked on driving behavioral change at different levels, and numerous Work-Outs were held for this purpose. Kerr held many training sessions, and to emphasize the importance of learning, he held the training sessions off-site. First, they would go for day-long sessions in hotels, then the teams would be taken off-site for half-day sessions. Over time, once the behavior had become more culturally ingrained, those work-outs migrated back to the office, attaching themselves to regularly scheduled meetings or lunchtime pizza parties. This happened when information sharing had become part of the fabric of GE culture. Kerr and the CLO office created a new framework, which ensured that people would continue sharing their best practices. Steve and his team further cemented the information sharing culture by turning best practice sharing into an honorable undertaking. It became a badge of honor for those whose shared information benefited the organization and got face time with the senior GE leaders, which was a powerful incentive to keep sharing the information. This new information and best practice sharing culture at GE helped drive innovation. For example, GE Medical was making pacemakers, so they built quality control systems to test them remotely. They adapted this technology to apply to jet engines. They then applied this idea of remote testing to power packs that GE manufactures for nuclear submarines. That’s quite a journey for a single idea to find application from tiny individual pacemakers to jet engines to nuclear submarines, showing the power of information sharing. Kerr looked to drive his own team’s continuous learning as well. They looked to the Japanese whose economy was booming at the time and were inspired to implement the Japanese approach to building learning organizations (notably, the concept had been developed by Americans, but it was the Japanese companies like Toyota Corporation that implemented it broadly first). GE’s historically high value on the power of training its employees played a key role in pioneering the CLO role and title. “Jack had us convinced that knowledge is portable,” says Kerr. And developing the role of CLO proved the veracity of that conviction. Unequivocally, Kerr drove major cultural change at GE over his seven-year tenure as CLO, leaving in 2001 when Jack Welch retired. In the pre-internet era everybody was copying things that GE did. Naturally, this helped spread the popularity of the CLO role. “Many people have kept the title but seem to have very different duties and responsibilities than I did,” says Kerr. As a CLO or learning professional, do you believe that your position’s key objective is to ensure the portability of ideas? If you do, then you are walking in Steve Kerr’s footsteps. Jasmine Martirossian, Ph.D., is the vice president of marketing at TTA, where she is responsible for all areas and aspects of marketing from strategy to implementation.